If you want to be featured in Kolaj Magazine, we offer a primer for artists seeking coverage in the magazine. Consider bookmarking this page for future reference. The Kolaj Magazine Artist Directory is our first go-to point when we are developing content or a project. The Directory is a tool for organizing and cataloguing artists who work in the medium of collage. Its audience includes the general public as well as independent curators, art venues, and writers. The editorial staff of Kolaj Magazine uses the Artist Directory to select artists to feature in the publication and to select artists for various curatorial projects including Collage Artist Trading Cards and Artist Portfolios in the printed magazine. We encourage galleries to send press releases to the editor or use our handy web form to submit all of the information we need to announce and share an exhibition online. While we prefer the information to come from the venue hosting the exhibition, it is perfectly acceptable for artists to submit an exhibition. SUBMIT EXHIBITION. 3) Make great collage & know why it’s great. This may seem obvious, but the fact that you made it doesn’t make it noteworthy. How are you challenging yourself and the medium? What stories are you telling? What ideas are you propagating? Why should someone care about the art you are making? Being able to answer those questions will do wonders for your career as an artist. And if you’re unsure, get an art buddy. Find someone who is enthusiastic about your work and ask them why they think its good. Open a bottle of wine, turn on a tape recorder, and interview each other. What are you really trying to say and do with your collage? Write it down. Sometimes we can be too focused on ourselves and our work. Challenge yourself to go look at art every week. Not online. In person. Get a membership to a museum and go often. Go to art openings every month. Look at what people are doing, how things are presented, how things are marketed and priced. And read…not just this magazine, but a variety of sources online and in print. See how people are talking about art these days. It will teach you how to talk about your own artwork and career. Are you a collage artist with an interesting studio space and want to be featured on the Kolaj Magazine website? Because we are interested in understanding an artist’s process and see where they are working, Kolaj Magazine‘s website features artist profiles from the perspective of where they make art. Featured previously were artists from Argentina, Canada, France, Greece and the United States. DETAILS HERE. 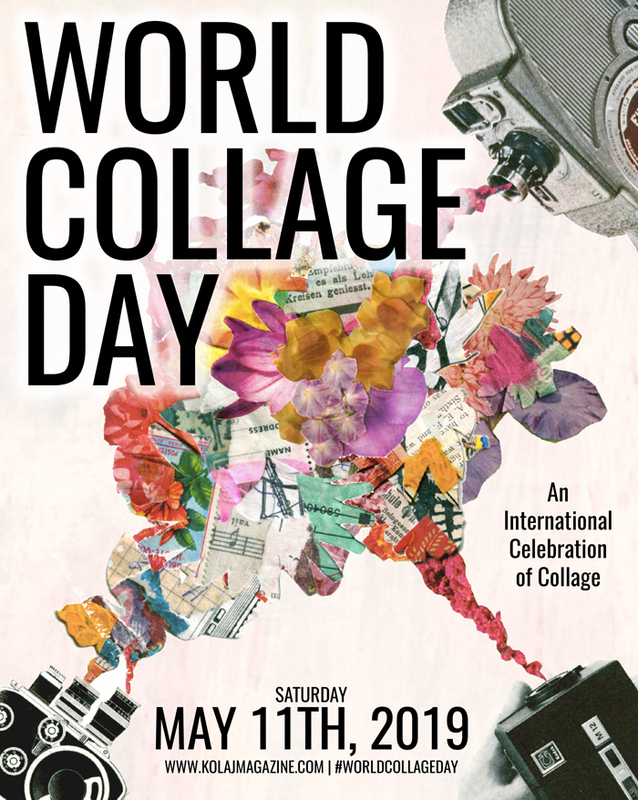 A staple of the first three years of the magazine, we retired the feature with Issue 12, but in 2017, we revived the concept when we invited collage artists to design cut out pages for the first World Collage Day Special edition. The feature was not only popular, it was informative to see how artists selected and organized the fragments. We have decided to once again make The Cut-Out Page a regular feature of the magazine. To submit your Cut-Out Page for consideration, read the full call to artists HERE. Kolaj Fest is a coming together of collage artists and art professionals; a multi-day festival and symposium about contemporary collage and its role in art, culture, and society; where the focus is how we celebrate and elevate the status of collage. Presenters will lead panel discussions and explore key curatorial issues. Artists will exhibit artwork, and create special activities and demonstrations. We will meet, network, share community, camaraderie, and fellowship. 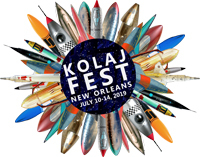 Kolaj Fest New Orleans 2019 takes place 10-14 July 2019. Visit the Kolaj Fest New Orleans page HERE to learn more and get updates. This is more than a shameless plea for subscriptions and followers. A lot of artists approach us without knowing what we are about. Pro-tip: This not only applies to Kolaj Magazine. Before you submit to a gallery, publication, residency, or art center, try to learn as much as possible about the organization before you approach them. Kolaj Magazine is on Facebook, Instagram, Tumblr, and Twitter. We know a lot of artists don’t feel great about their writing: left versus right brain and all that. But that doesn’t mean you don’t have a story to tell. Our editor knows this and will work with you if you have a good story to tell. 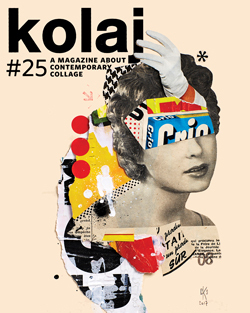 Kolaj actively seeks articles and interviews about collage. Articles explore a topic related to how collage is made, how collage is exhibited, and how collage is collected. We are also interested in articles which explore collage on a thematic level, that is, how collage speaks to our moment in time. We also seek articles about the history of collage and biographies of artists who have made collage in the past. To submit a story idea, send an EMAIL to the editor.